What are our quality engineers doing on-site during inspections? We receive questions relating to quality inspections and the inspection process quite often. 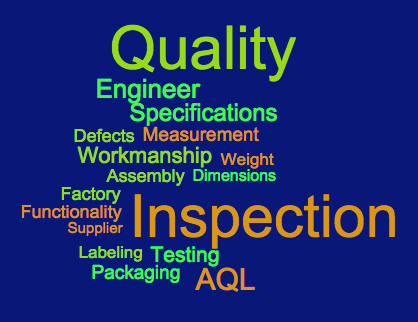 One of the most common questions we receive concerns the benefits of inspecting product for quality prior to shipment. The short answer is that inspections reduce overall quality risks and cost! Another question we receive often relates to what happens during a product inspection? What do our quality engineers do on-site? Is everything packaged? Our general rule is 100% produced and 80% packaged for a pre-shipment, final inspection. Failure to meet expectations for quantity can result in a “missed” inspection result. For more information regarding the difference between first-article, in-process and pre-shipment inspections, read our article here. Is the packaging free of any defects? Is a drop-test required for packaging integrity evaluation? This reduces the likelihood of damage during transit. Does the packaging meet client and/or other specifications? Are there any safety concerns, such as suffocation warnings required on certain polybags? Are defects within the Acceptable Quality Limits? A random sample is pulled to evaluate for cosmetic/workmanship defects. Inspectors use a checklist to assist with defect identification and classification. Defects noted are categorized as either major, minor or critical. Classifying Defects: Is it Major, Minor or Critical? How do select AQL levels? Does the product work as indicated? A reduced sample is usually pulled for functional testing, as applicable. Inspectors verify that the product assembles and functions as indicated by any inserts/manuals. Inspectors verify applicable measurements such as dimensions and weight. For textiles, it may be stitches per inch, or other as determined by the type of product. Inspectors take detailed photos of the facility, product, packaging, labeling and defects noted. Clients can compare our photos with their samples or otherwise have photographic evidence. Found your blog. Its really nice oncivil engineering. I appreciate your article. Its important to get quality all type of civil engineering site. So thanks for sharing all that important information. I can say or add, to check the quality of material arrived by a quality engineer and make sure that the material is approved by the Client representative or Consultant.